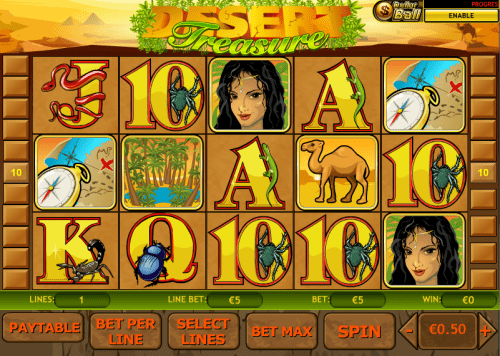 Desert Treasure is a 5 reel and 20 payline slot game produced by the software developers at Playtech. The game has an Egyptian theme and features iconic imagery from Ancient Egypt including various animals and scenes. The game is set against a sandy background filled with sand dunes and pyramids. The dominating color palette is made up of warm yellows, browns and oranges. The graphics are simple but well designed and there is no lack of interesting icons, with even the low value card symbols being adorned with Egyptian insects and animals. There are 2 bonus features in this game that are activated by 2 separate symbols, creating greater winning opportunities and adding excitement to the game. The Treasure Chest Bonus is activated by landing 3 or more Compass symbols on an active pay-line. Players will be taken to a new screen where they will get to pick the same number of treasure chests as the number of Map symbols you landed in the base game. Each chest contains a cash prize inside and they will be added at the end of the round to give you your total prize. The Free Spins Bonus is activated by landing 3 or more Queen symbols anywhere on the reels. Players will be immediately awarded with 10 Free Spins. In the Free Spins Bonus it is possible to reactivate the Bonus by landing at least another 3 Queen symbols on the reels. The winnings during this round will be multiplied by 3 at the end of the round. The Wild symbol is the Wild Snake symbol. This symbol has the power to replace all the other symbols in the game except for the Queen Scatter and the Map Bonus. The Wild Snake is also the game's highest paying symbol and pays out the maximum amount of 10,000 coins for 5 in a row. 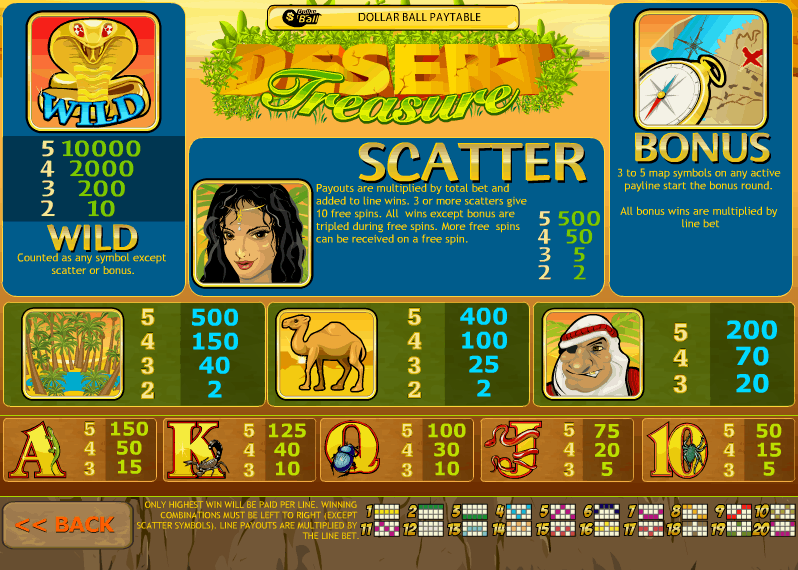 As in many other Playtech slot games, Desert Treasure has a Dollar Ball Progressive Jackpot which can be enabled by clicking the 'Dollar Ball' button in the top right-hand corner of the screen. The game works in a typical lottery style and involves players picking 5 of 49 numbers. If your 5 picked numbers come up in the draw, you will have won the progressive jackpot, which can be a huge amount. The Bonus Symbol is of a Compass and rewards players with multipliers and unlocks a bonus round. The Scatter symbol is the Queen and unlocks free spins as well as awards multipliers. The Wild is the Snake. It has very high payouts and can also substitute for all other game symbols except for the Bonus and the Scatter. Desert Treasure is well-designed and very popular online slot game by Playtech. The overdone Egyptian theme gains new life in this game that has eye-catching graphics and engaging features to keep players on the edge of their seat. Great care has been taken in the design of all aspects of the game. The built in Dollar Ball Progressive Bonus is a nice added extra and gives players the chance to win a life-changing sum of money. The RTP of Desert Treasure is also an impressive 97%.